I was very much disappointed when i installed Skype in Fedora, three causes which are as follows in the order. First, Skype for Linux is very old version (2.2 beta) than the Windows Skype, second, the video was too dark or black, and third cause surfaced after i installed Fedora 16 x86_64, no 64 bit binary for Fedora was available. The third one was solved as described in this post: Running Skype for Fedora x86 in Fedora x86_64. For the first one i can’t do anything, but there should be some solution for the second problem: dark video. Cheese (a video capture application) works fine and video is good. Searching in the skype forums got a lot of mumbo jumbo solutions of which none worked. After a lot of search i got a very simple solution. Edit (16.06.2012): The first problem seems to solve atleast upto some extent as Skype 4.0 is now out and can be downloaded here. If you have an output with uvcvideo in the first column, then you have the module installed. To install the application guvcview best thing is to check your distro repositories. For Fedora it is available from the rpmfusion-free repository. If you do not have this repository setup, then follow instructions here: http://rpmfusion.org/Configuration/. After you have configured the repository. Then execute the below. With guvcview you can capture images, videos and control your video camera parameters. If you run guvcview from your kickstart menu then it will also launch a video window. You can check out the different controls here. For the current purpose we will not require the video window guvcview provides, instead we require only the controls of guvcview and control other application’s video input. To do this guvcview has a command line option -o or --control_only . Starting guvcview with this option will only give you the control window, and from this window you can control the parameters of video input of any other application which is using the video input device which guvcview is controlling. Therefore to make it work with skype launch skype and login, click on the Skype logo (the small S in the bottom left corner of the skype window), click Options, click on Video Devices from the left side menu, and click on Test button. 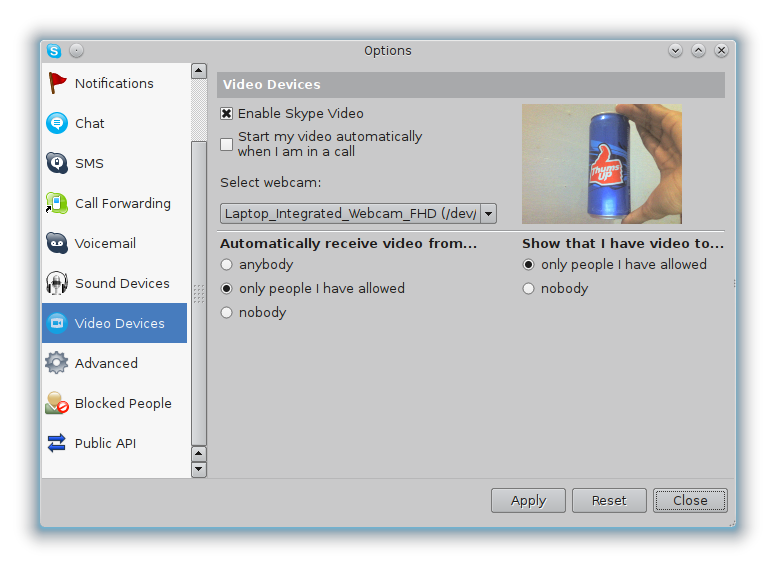 Then launch guvcview with the --control_only option (although you could launch this before skype). Next, simply click on the Exposure, Auto Priority check box, and notice the sample video test in the Skype video test window change. That’s it. Check out the screenshots from my system. Note the sample video test samples. To get the value of the property Exposure, Auto Priority you need to do the following. Note that, this is not a one time configuration, you need to keep the guvcview window open in control only mode, whenever you want to control any video input through that device guvcview is controlling. When you receive a call or call some one, before or after you start the video launch guvcview -o and check the Exposure, Auto Priority and continue as normal. When call is finished you can close guvcview. To avoid launching a terminal to execute guvcview -o you can enter a new or modify the existing fedora kickstart menu entry (by rightclicking it and selecting Edit Applications menu) to to launch guvcview -o instead of only guvcview. Or simply run the command line tool uvcdynctrl once to set the Exposure, Auto Priority property. You can also control any other video input application like above. Playing a lot with the controls messes up the video configuration. 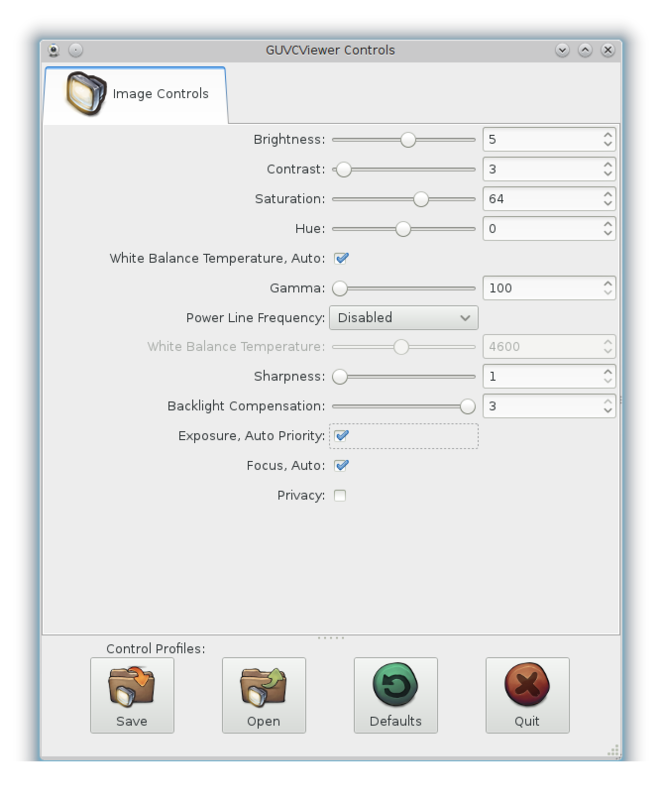 But using the Exposure, Auto Priority option works well. Great stuff. This has bugged me for ages. Incredible. I’d installed guvcview a few months ago, but never knew that launching only the control panel would allow it to be run in conjunction with Skype. Thank you very much for this post! 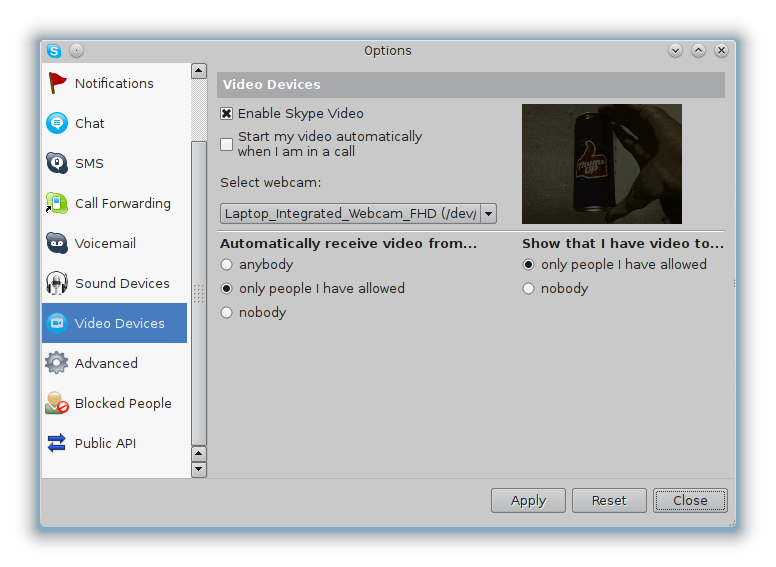 As an aside, I wonder why Skype hasn’t given Skype for Linux the same video configuration option that it has on Windows. Thanks for this giant share my friend, very helpful for upset skype users like me, like us..I would spread your guide inside italian forums..there are many with the same boring issue..that must be aware of this fix. Thanks a lot. Great to know it helped you, thanks for dropping by! Is your camera model supported by the current version of guvc ? Thank You!!! The only reason why I have yet to switch from windows completely are Skype and my printer. You actually solved one of my biggest problems! It’s great to know it worked for you! I hope you get your printer problem solved in Linux, maybe try in the forums ? Thanks for telling me but I’ll see if I’ll also get these problems but for now everything works fine. It might be because I’m not using Fedora but Manjaro and Skype 4.1. I did check the forums but I’t just that Canon doesn’t like Linux very much and therefore sadly doesn’t supply proper drivers. Hi, opening guvcview fixes the exposure on my Microdia generic webcam. But is thre any any any way to make this permanent? May be there is some, but at this moment I am not aware of. Probably playing with the settings which guvcview changes in the background may help. Sorry couldn’t help you any more in this case at the moment. I will update this page if I get some permanent solution. Nice to know it did work for you. Thanks for visiting. Nice to know that it helped you. Nice to know the fix woked! Thanks! Great to know it worked. I also use the same, Fedora 16 :D .
Nice to know it did work for you. At present I do not know how to make it permanent. For me, I myself go through these steps. I believe there should be some way to automate. Best way is to write a shell script containing the command line command for the guvcview, once it is executed, run skype from command line. Try it and let me know. You can also increase the brightness with v4lctl. Thank you for the information, nice to know yet another way. The vanilla version under arch -z for control only. Not sure if this is true across the board for the new version or if other distros use custom commands. -o is audio codec. I find manual adjustments work better than the auto. Auto does good enough though, colors just get washed out. Any way just letting you know for if anyone else finds this and has an issue. That is true, manual tuning will get you the best results, but for simplicity the auto is good. Although I do not see this problem in the latest Fedora version with the latest Skype.